The bracelet is extremely feminine and elegant decoration which is worthy of special attention of beauties and fashionistas. If we check the etymology of the word "bracelet", we can find out that it has French roots and derives from the word bras, "hand". 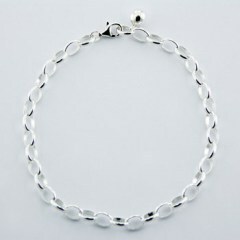 Nowadays “bracelet” is a common name for fashionable jewelry worn on the hand (or on the anklet). 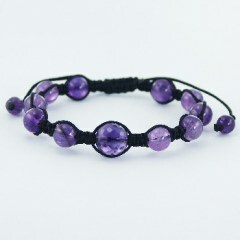 However the very first bracelets were created as magical talismans to protect the owner from illness and evil spirits. 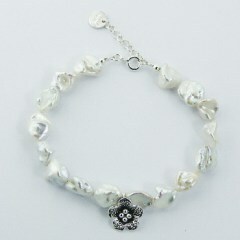 Today a bracelet is one of the most actual trends especially for women. 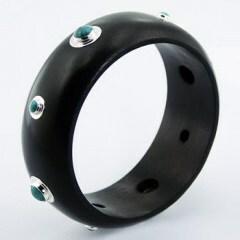 Modern bracelets can be made of a wide variety of materials such as beads, various type of metals, stones, leather, etc. We offer sterling silver bracelets for any occasion – a macrame bracelet or the one with a tiny little charm could be a perfect gift to a teenage girl, colorful wrap bracelets for bohemian parties, gorgeous gemstone and shell bracelets are definitely made for a special night, plain silver or shamballa bracelets will help to jazz up an everyday look. bright and colorful models for those who prefer confidence and follow the latest trends. Originated from Thailand our online collection has unique design and made with professional craftsmanship and positive energy. Free shipping worldwide is offered for every order and is absolutely reliable and traceable. Glider - bracelets, consisting of individual elements, with a hinged or springy connection. Chain - several rings (links) of various shapes, interconnected. Macrame - an openwork design, woven from any materials. Closed - have the form of a one-piece ring. Spiral - have the form of a broken ring. Hinge - consist of two halves, on the one hand fastened together by a hinge, and on the other side they are connected with a lock-latch. 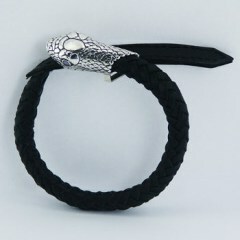 Snake bracelet is a spring-shaped bracelet of imitating the shape of a snake. Glove Bracelet – a bracelet woven with beads that covers the wrist without touching the fingers. Studded bracelet is a bracelet decorated with cover plate, as a rule, metallized elements in the form of spikes. Chain bracelet - links fastened together by a different method of weaving. Watch bracelet is a decoration the main element of which is a watch. It can be located in the center or used as a pendant on a chain bracelet. "Pandora" bracelet - a bracelet with elements (stones, pendants, etc.) strung separately on a chain or a cord. Tennis bracelet - a thin bracelet, inlaid with precious stones, usually diamonds. Carapace - weaving chain where links of an oval shape are curved in the form of an incomplete figure of eight, lie in the same plane. Anchor - weaving chain where links are located in mutually perpendicular planes. 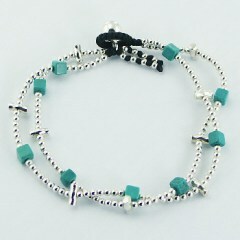 Modern Venetian bracelet - weaving, having a rectangular cross-section. Byzantine is a complex form of weaving where simple links are combined with twisted rings in the form of "eights" and "balls". Royal - links of the bracelet, having the form of a crown. Rollo is a standard anchor weave made of round links. Pearl is a chain in which the links have a spherical shape. Bismarck - each link of the chain is made in a form of a two-row complete spiral. Double diamond - weaving consists of diamond-shaped intercepting links. 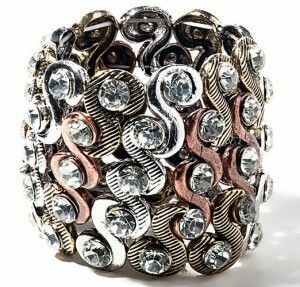 Singapore - links in the form of rings, interconnected, creates a twisting effect. Drawstring - compaction of armor weave links or other classic types. Nonna - round links are located one inside the other creating a three-dimensional pattern. Fox tail - each new link is layered on the previous one leaving no empty space. When choosing a bracelet you need to pay attention to the proportions. In the case when the wrist is big it is necessary to exclude too thin or on the contrary very large bracelets. On a miniature hand almost all forms of jewelry look good except for bulk ones. On a standard wrist you can wear a bracelet of any size. The two main criteria that are decisive in choosing a bracelet are your clothes and the event that you are going to attend (it can be both a theater and a simple walk in the park). Despite the fact that the mix of different styles is now in fashion, it is nevertheless important that the bracelet is in harmony with your overall style / look, combined with other jewelry. Relevance is a key component in choosing a bracelet. It is not appropriate to wear bright, shiny bracelets at a business event, unless it is a corporate party. An elegant low-key bracelet with small details is most appropriate to wear to the office. But a party, a walk or a creative evening is a great reason to wear a bright, memorable bracelet that reflects your mood and sense of self. 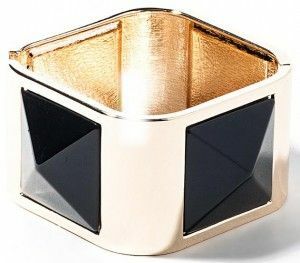 How to determine the size of the bracelet? It is easy to determine the size, if you measure the wrist circumference - this will be the inner side of the bracelet circumference. It is better to make a small allowance, since the bracelet should not only slide off the hand, but also squeeze the hand too. The ideal is when a finger can be inserted between your wrist and bracelet. What to wear and how to wear bracelets? It looks good when a jewelry set suits what you wear and the overall style of your outfit. Bracelets should be worn only on open skin, not on the sleeves. In the Paleolithic era, they were made of mammoth tusks. A bracelet became a decoration when it was made of metal somewhere in the Bronze Age. Especially interesting items were worn by the ancient Greeks and Romans. In the middle ages the fashion for bracelets took a pause as women's clothing had long sleeves. However, in the Renaissance time the fashion for short sleeves came back and made these accessories in trend again. Good to know that the bracelet originally was considered as female and male decoration, for instance for the German soldiers it was a symbol of valor. In the old days wearing bracelets on the forearm was allowed only for kings, princes and their wives. The lower class could adorn their wrists. In 2010, Altai archaeologists discovered the oldest female bracelet in the Denisov Cave, its age was 40-50 thousand years (Paleolithic period). There was a special hole in the ornament where the rope was supposedly passed through. During the Neolithic period men overtightened their wrists with a strip of skin, so that the hand could stand a heavy load when throwing a spear. This could help to avoid a number of injuries. Currently this technology is used during athletics and weightlifting or wrestling competitions. In addition to practical use the bracelet was also used by the cavemen as a talisman. The object was made of mammoth tusks, animal teeth, wood, ropes, minerals, stones, etc. Cavemen endowed bracelets with mystical properties and used them in rituals, driven off evil spirits. In the antique period bracelets became widespread among men and women in ancient Egypt, Rome, India, Greece and Africa. With the development of metallurgy people began to make jewelry first from copper, and then from bronze, gold, and silver (they used upper classes). 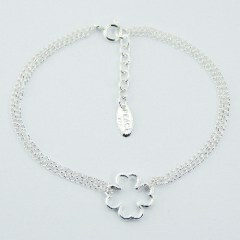 The Romans depicted snakes, lions, coats of arms and branching ornaments on the bracelets, the Greeks - leaves, gods, etc. The ancient Egyptians created engravings on the ornaments with images of supernatural creatures. As a rule, the pattern and color of the bracelet were combined with the whole ensemble of clothes. The jewelry emphasized the owner’s power. The upper classes bracelets were made of expensive metals and stones, colored glass. The kings and priests could wear one or several narrow and wide bracelets on the wrists and forearms. The Egyptians used the accessory also as an ankle-leg decoration. The warriors had nominal bracelets, which were symbols of courage, honor and courage for them. Lower classes made ornaments of textiles and stones, usually worn on the wrist. 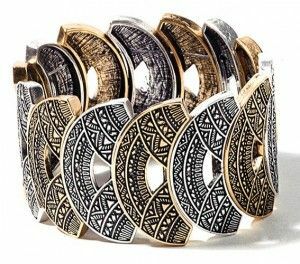 In Russia in the 9th-12th centuries the bracelets of higher class representatives were made of gold or silver and were decorated with blackening. Among citizens – the bracelets were made of glass, and among the peasants - from copper, leather, and cloth. The Slavs called bracelets "the hoops" (as they were wrapped around the arm). They were worn on the left or on the right hand, sometimes on both and several at once. They could be worn on the wrist or forearm, on top of or under the sleeve. There were several types of metal bracelets. By locking method: closed and open, folding (consisting of two halves connected by small loops and clasps). For decoration: twisted, lamellar, wicker. According to the method of manufacture: forged and cast. On the jewelry found by archaeologists there are distinguishable images of mythical animals and birds. Bracelets also depicted various plots, for example, musicians playing instruments, girls performing dances, etc. Scientists believe that the tradition of artistic design in Russia was borrowed from ancient Greece, Rome, India and Egypt. Fashion for some special types of bracelets was spread throughout Europe from the south, from Byzantium. For example, bracelets with ornaments from the drota with the ends, imitating a knotted knot. Around the X century they appeared in Russia and then became widespread in Scandinavia, Finland and the Baltic States. There are discussions about bracelets the ends of which imitated animal head. Some scientists believe that these jewelry were brought from Byzantium, but others believe that in the X — XII centuries Slavic jewelers were already highly skilled craftsmen and could easily create bracelets by their own design, imitating ancient antique patterns. Warriors wore bracers and leggings (part of the armor that protects the hands from the elbow to the wrist and the legs from the knee to the ankle), consisting of metal plates. In the Middle Ages long sleeves became fashionable in some European countries people stopped wearing bracelets. In the Renaissance bracelets together with fashion for shortened sleeves again became an integral part of the European wardrobe. In the 16th century French jewelers began to create bracelets coated with colored enamel. The accessory was encrusted with precious stones and pearls. Men's and women's bracelets were decorated with carved patterns depicting plants, animals, birds, etc. An accessory imitating the image of a squirrel dating from the 14th — 15th centuries is very well known. Knights wore bracelets as a sign of love, receiving them from the ladies of their heart and putting them on left hand. In the 16th century, handcuffs for prisoners appeared in England. They consisted of two bracelets connected by a short chain. The handcuffs were made of metal. The bracelet had a movable element fixed in one position with the help of a latch. The handcuffs were unlocked and locked with a key. Some models are locked by pressing the latch. In the XVIII century closed clothes came into fashion. Wide bracelets were sewed into clothes in the manner of a cuff. Chain bracelets appeared and were worn over the sleeves. In the 18th century during the reign of Alexander I the wearing of bracelets and chains at the ankles became fashionable. In the 19th century the decorations of the Tula Arms Plant which masters were famous for their artistic finishing skills became widespread. 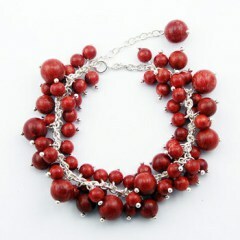 French jewelers began making coral bracelets. In the Victorian era, accessories were worn in pairs. The decoration has become meaningful. It could have be mystical values (figures, attributes of superstition) as well as a portrait of a beloved one. Engraving has become widespread. The bracelets were decorated with the form of an acrostic where the first letter of the stones determined various feelings: friendship, love, affection, etc. Double bracelets that consisted of two rings connected to a chain with a lock in the form of a heart became very famous. They were worn on one hand on the wrist closer to the elbow. Alexander Pushkin wore a bracelet with a Turkish inscription on the forearm of his left hand. The accessory was made of gold and green jasper. In 1892 the Russian magazine "Fashion Light" recommended to use of bracelets to decorate hair. The bracelet was supposed to be wrapped around so-called Greek knot. 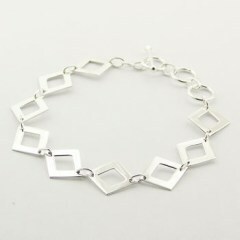 In the first half of the 20th century bracelets obtained new forms: square, triangular, trapezoidal, etc. Designers began experimenting with materials (plastic, leather, silicone, glass, fresh flowers), combining them with each other. In the 1930s the jeweler Fulco di Verdura created a bracelet for Coco Chanel in the form of a one-piece ring of silver covered with creamy white enamel. The decoration was depicted with Maltese cross inlaid with precious stones. In the 50s, the designers of the jewelry house Van Cleef & Arpels made a bracelet with the image of honeycombs. The jewelry looked as a wide ribbon that consisted of several gold bracelets from the fashion house Christian Dior (1947) with hexagonal plates. Each of them was depicted with a star decorated with a large stone - a ruby or a diamond. The clasp had the shape of a curl and was decorated with stones in invisible frames ("Serti Mysterieux"). This form of insertion of gems was developed and patented by Van Cleef and his partner Arpels in 1933. The secret was that the stones were tightly - one after the other - strung on the thinnest rails made of gold or platinum. At the same time the surface of the gems looked absolutely flat. In the 50s bracelets of gilded threads appeared. In 1952 the jewelers of the Cartier made for the Duchess of Windsor a panther bracelet made of onyx, diamonds and diamonds. In 2011, Sotheby’s London auction house sold this jewelry for $ 7 million. In 1954 Van Cleef and Arpel made a “Zip” ornament for the Duchess of Windsor. When the zipper was in the closed position the accessory was a bracelet and in the open position - a necklace. In the 60s bracelets made of beads, threads and ropes were popular. Braided jewelry styled hippies. In 1982 the Pandora company released the Pandora Style bracelet. The decoration consisted of individual beads and pendants strung on a cord. 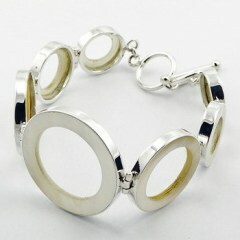 The buyer could choose the elements for the bracelet. 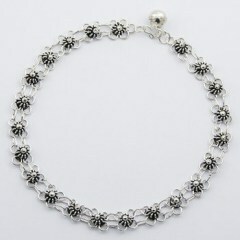 In 1987 thin diamond jewelry began to be called tennis bracelets. The name of the product was due to athlete Chris Evert. The American tennis player interrupted the game at the US Open because a diamond bracelet fell from her wrist. At the press conference Chris Evert explained that she could not but stop the match having lost her “tennis bracelet”. In the fall-winter 2010-2011 season the designers of the Van Cleef & Arpels created a women's collection of jewelry made of white and pink gold. The product consists of five thin closed and open bracelets, fastened together. In the same season in the women's collection of Bottega Veneta Thomas Mayer presented wide open bracelets depicting a rhinoceros beetle. In 2012 jeweler Jason Arasheben created a bracelet for the winner of the WSOP poker tournament. The product was decorated with diamonds weighing over 35 carats. On the manufacture of the bracelet took 170 grams of 14-carat gold. In the spring-summer 2012 season Domenico Dolce and Stefano Gabbana presented the men's braided khaki bracelets on the latch. The metal tag of the accessory featured the Dolce & Gabbana brand logo. In the women's collection Schumacher Autumn-Winter 2012-2013 Dorothea Schumacher presented chain bracelets with a four-leaf clover decor. Bracelets are regularly released by such brands as Bvlgari, Cartier, Tiffany & Co, Van Cleef & Arpels, Giorgio Armani, Gucci, Dolce & Gabbana, Chanel, Lanvin, Blumarine, H & M, etc. 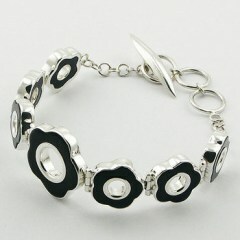 Modern fashion for bracelets is first of all a mixture of styles. 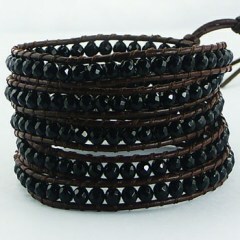 Now it is also very fashionable to wear a large number of bracelets on hand. If earlier it was believed that bracelets and watches should not be worn together, now this is just in fashion. Fashion is changing but the popularity of a favorite female accessory remains the same! When purchasing a bracelet do not forget that this accessory will perfectly complement other designer jewelry made of natural stones.